It’s Official: Mauzy Is San Diego’s Best! Mauzy customers always come first. We adhere to philosophies and values that differentiate us from other San Diego HVAC & Solar companies. Excellence in the quality of our work , the highest quality of service and keeping our prices competitive are our top priorities. We work hard to ensure your home will always be comfortable & energy efficient year-round. 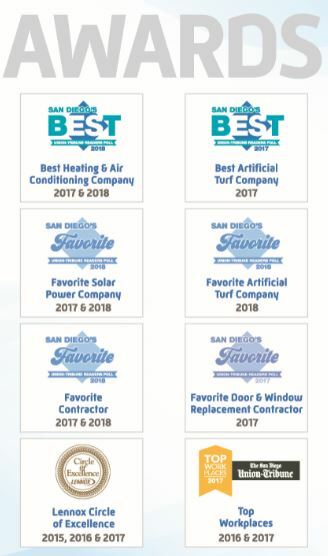 Mauzy has been the leader in heating and AC services in San Diego County for over 50 years and our recent awards speak for themselves. Each year, the San Diego Union-Tribune polls its readers to find the “best of the best!” at providing goods & services in our community. 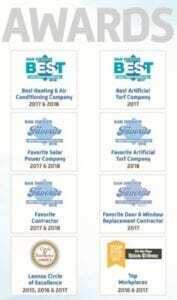 This year, amount a bundle of other awards, Mauzy took home BEST Heating & Air Conditioning Company – for the 2nd year in a row! The Lennox Circle of Excellence Award is given to the top 45 dealers in North America. Based on merits of exceptional customer service, highest quality installations, ethics and integrity, Mauzy received this award – for the 3rd year in a row! Mauzy’s family values show in our quality and our work. We are three generations strong abiding by a strong commitment to our customers, our business and our craft, and these awards inspire us to just keep getting better! Give us a call today to see what our team can do for you! Let’s face it, you deserve the best when it comes to your home, and our team will work to make sure that you never receive less than the very best.